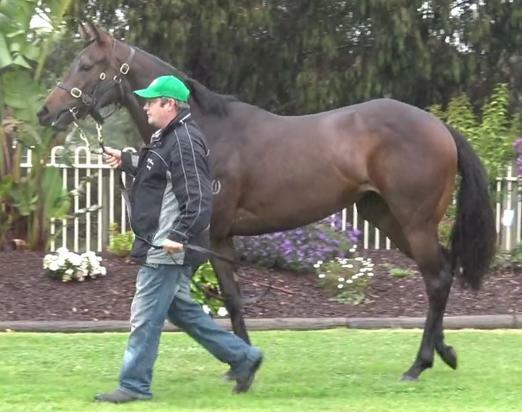 This strong well-muscled filly is from a very handy family, her dam is a multiple city winner and has thrown several winners. TURFFONTEIN (AUS) (Chestnut 2004-Stud 2010). 5 wins-1 at 2, MVRC William Reid S., Gr.1. Sire of 123 rnrs, 65 wnrs, inc. SW Fontiton (MRC Blue Diamond Prelude (f), Gr.2), Fontein Ruby, SP Lyuba, Turfane and of Faint Blaze, Finke, Safariann, Give Us a Go, Hunters Grace, Turf Crusher, Central Pass, Constantine, Double Superlative, Sight Leader, Widgee Turf, Dance With Fontein, Gold Fontein, Prince of the Turf, Turfin' Around, Turtles Nest, etc. Hard Romp (g. by Hard Spun). 6 wins to 1100m, A$324,920, VRC 3AW Community Raceday H., Rod Johnson H., MRC Martin Collins H., Cove Hotel H., 2d MRC Natalie Hunter 2YO H., MVRC Signage Concepts H., MRC Polytrack H., Sportingbet Best Tote H., Deadly Design H., Grand Hotel Frankston H., MVRC Holman Industries H., 3d VRC All Victorian Sprint Final H., L, Takeover Target Tribute H., MRC Ladbrokes Infohub H., VRC All Victorian Sprint Series Heat H., MVRC Essendon Mazda Challenge H.
Romping (g. by Dash for Cash). 6 wins from 1100m to 1600m, A$149,700, HK$3,430,500, VRC KA Morrison H., MVRC Members Equity Bank H., HKJC Lantau Peak H., Chatham H., Guangzhou Gourmet's Trip H., 2d MRC Sky High Mt Dandenong H., HKJC Ashley H., GOME Cup, Jebsen Building Products H.
Aldeburgh (g. by Danehill Dancer). 2 wins at 900m, 1100m, 2d STC Hyland Race Colours H.
Close the Beaches (g. by Sharkbite). 3 wins to 1200m to 2016-17 in Aust. Finanza (f. by Perugino). Placed in Aust. Drizzle. 7 wins from 1500m to 1800m, A$451,755, GCTC Marriott Magic Millions Stayers Cup-twice, STC Roxy Hotel Parramatta H., 2d MRC Salamander H., MVRC Pacific Communications H., 3d MVRC Dycer Constructions H., MRC Penny Edition H.
Romalpa. 3 wins. See above. RED TRACER (Dane Shadow). 15 wins from 1100m to 1600m, A$2,371,010, VRC Myer Classic, Gr.1, Qld Tatt's RC Tattersall's Tiara, Gr.1, ATC Millie Fox S., Gr.2, Premiere S., Gr.2, BRC Dane Ripper S., Gr.2-twice, MRC Tristarc S., Gr.2, ATC Millie Fox S., Gr.3-twice, PJ Bell S., L, James HB Carr S., L, Toy Show H., L, AJC Bosco Bulldogs H., STC Kidney Kids H., 2d ATC Coolmore Classic, Gr.1, Queen of the Turf S., Gr.1, Light Fingers S., Gr.2, Surround S., Gr.2, Breeders Classic, Gr.2, Golden Pendant, Gr.3, Wyong RC Mona Lisa S., L, 3d ATC Epsom H., Gr.1, Canterbury S., Gr.1, Queen of the Turf S., Gr.1, Breeders Classic, Gr.2, MRC Tristarc S., Gr.2, AJC Sadleir P., STC Liquor Coop H., 4th Qld Tatt's RC Tattersall's Tiara, Gr.1. SHELLSCRAPE (Dane Shadow). 6 wins-3 at 2-to 1400m, A$734,530, AJC Galaxy H., Gr.1, Roman Consul S., Gr.2, San Domenico S., Gr.3, Qld Tatt's RC Australia Post S., L, BTC Rubicon Design & Construction P., STC Theraces.com.au 2YO H., 2d AJC Up & Coming S., Gr.3, Australia Income Protection P., Soho Square 2YO H., STC Wests Ashfield 2YO H., Hawkesbury RC Reavill Farm Inglis Series 2YO H., 3d VRC Coolmore Stud S., Gr.1, Lightning S., Gr.1, AJC Shorts H., Gr.2, STC Grand Pavilion 2YO H. Sire. COUNTERATTACK (Redoute's Choice). 4 wins-1 at 2-to 1350m, A$637,875, to 2015-16, BRC Fred Best Classic, Gr.3, ATC Heritage S., L, City Tatt's RC Brian Crowley S., L, ATC TAB Place Multi 2YO H., 2d ATC Theo Marks S., Gr.2, Arrowfield 3YO Sprint S., Gr.2, VRC Tab.com.au S., Gr.2, ATC Hall Mark S., Gr.3, Hyland Race Colours 2YO H., TAB Place Multi 2YO P., 3d VRC Coolmore Stud S., Gr.1, ATC Eskimo Prince S., Gr.3, CFMEU West Tradies 2YO P., 4th BRC Champagne Classic, Gr.2, Sires' Produce S., Gr.2. Mad Hatter (Lunchtime). 7 wins from 1200m to 1650m, A$122,940, VRC Full On Aces H., MVRC Valley Food Court H., VATC Bond H., BATC Better Boy H., Orlando Gramp H., 3d Qld Tatt's RC Tattersall's Mile, L. Sire. SNOW EXCUSE (No Excuse Needed). 3 wins-2 at 2-at 1200m, Levin RC Ryder S., L, 2d ARC RJ Skelton Vase H., 3d Foxton RC Castletown S., L, Counties RC Parish Fundraiser H.
HIDDEN WARRIOR (Hidden Dragon). 5 wins to 1350m, A$413,530, MVRC Red Anchor S., Gr.3, ATC Lidoran Group Spring Flying H., 2d ATC Breeders' P., L, Carrington S., L, 3d ATC Hall Mark S., Gr.3, Carrington S., L.
DEFIANT DAME (More Than Ready). Winner at 2, A$86,500, AJC Gimcrack S., L, 3d Wyong RC Magic Millions 2YO Classic. Producer. Funlove (Shovhog). 3 wins to 1400m, A$250,450, BTC National Pub Poker League Quality H., MRC Winning Edge Presentations Cup H., 2d GCTC Silk Stocking H., L, 3d Queensland Guineas, Gr.2. Producer.